Abhinav Bhattacharyya joined the TSRC team in July 2015. He is a graduate of the Transportation Engineering MS program at UC Berkeley. His research interests lie in shared mobility systems and ways to leverage data for improving urban transportation planning models. 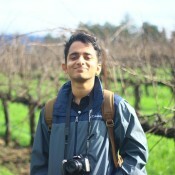 Besides work, he likes to dabble in travel photography, explore the California redwoods and read science fiction.